Mature Straw mushroom 200 grams. Shallot, handful, peel and clean. Garlic, 10 cloves, peel and clean. Bell Chili 4 pieces, clean. Fish Sauce 1.5 table spoon. Coriander and Mint for garnish. 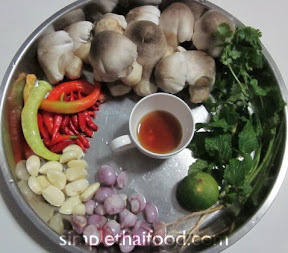 Thinly slice the Mushroom and roast them in the wok with 1 teaspoon of salt in low heat. Let the juice come out and turn all the sides to make them thoroughly cooked. When the pieces turn light brown, remove from the wok. Roast the clean Garlic, Shallot and Chili the same way, but without salt: With low heat and turn them around occasionally that all sides cooked. Mix the Roasted Mushroom, Garlic, Shallot and Chili into a Mortar and mix them into paste. Season with Lemon Juice and Fish Sauce, if the mixture is too thick for you, you may also add a few tablespoon of cooked water or stock. 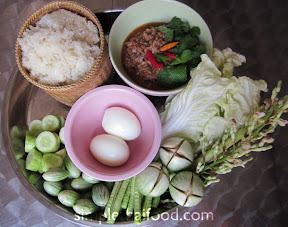 Tip: I love to have this sauce with sticky rice and fry fish (common way how north-easterners have it), but it had be had with boiled eggs as well.